Abstract: Anti-TNFα drugs have been shown to be effective for maintaining stable remission in patients with Crohn’s disease. However, some problems have been identified during clinical use of this class of drugs, such as secondary treatment failure, in which the drugs become progressively less effective with time, and the development of paradoxical reactions such as psoriatic skin symptoms. Thus, while anti-TNFα drugs are used to treat psoriasis, they can sometimes also cause paradoxical psoriasis, characterized by the appearance of psoriasis-like eruptions, which has recently begun to attract attention. Furthermore, inflammatory bowel disease is not only associated with intestinal lesions, but also with a variety of extraintestinal manifestations, of which arthritis is relatively common. We encountered a case of Crohn’s disease with arthritis, as an extraintestinal manifestation, and paradoxical psoriasis caused by infliximab treatment, in which ustekinumab proved extremely effective, not only for alleviating the arthritis, but also against the skin manifestations. 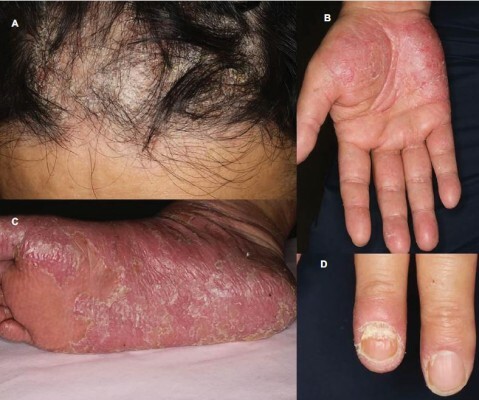 To the best of our knowledge, this is the first reported case of the efficacy of ustekinumab against paradoxical psoriasis and arthritis in a patient with Crohn’s disease.